The $644 million the City of New York distributed in grants and loans among 55 projects during the first half of 2018 is just a bit more than the $530 million in debt financing Gary Barnett secured that summer for just one 485-unit condo project in Downtown Brooklyn. Just the same, that $644 million was leveraged to obtain billions in additional financing and funded 9,340 units during the first half of the year. Such a piece of financing from the city, be it a grant, a loan, tax credit or a special sale, is critical for affordable housing projects, and tough to land. The evidence is in the most active firms. 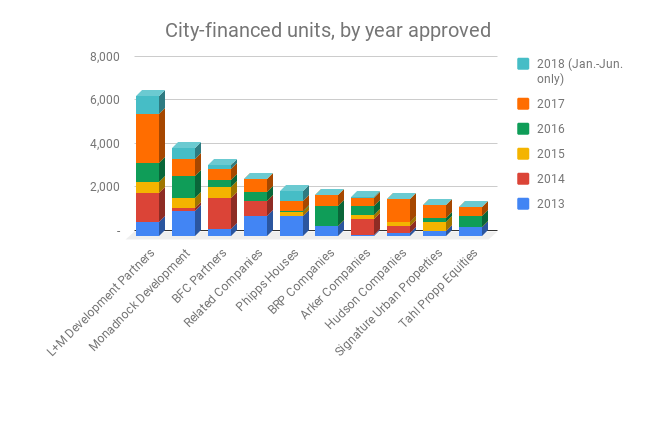 Since 2013, the top five firms navigating this market are all veterans with decades of affordable housing experience: L+M Development Partners, Monadnock Development, BFC Partners, Related Companies and Phipps Houses. The risks are different than those of market rate housing, and to make a deal work, these affordable housing developers fight for a share of the city’s dollars. Because of the insatiable demand for affordable housing in New York, there is no risk concerning revenue, which a stark contrast to market-rate development. Instead, the risk is moved over to sourcing viable deals and structuring the financing. “You have to to carry land. You have to wait on the availability of the city’s resources — and at the moment there is a scarcity of tax exempt bonds,” said Kirk Goodrich, director of real estate development at Monadnock Development. PincusCo Media analyzed the public records available through Local Law 44, which requires the city to disclose developers, contractors, financing, rents and other data points for any development or rehabilitation project that received city financing through grants, loans, city-allocated low-income housing tax credits and other kinds of financial support. The analysis covers January 2013 to June 2018, which is the latest data available. To state it plainly, L+M and Monadnock, in this realm, are in a league of their own. They are the only firms that average more than two projects a year. L+M averaged five per year from 2013 to 2017, and Monadnock averaged four. L+M, founded in 1984 and led by CEO Ron Moelis, has obtained financing for 28 projects since 2013, totaling 6,444 units. The largest individual project was rehabilitating a Rockaway housing complex with 1,093 units through at $4.2 million city-financed loan in 2017. L+M’s second-largest project was in partnership with BFC to buy a stake in New York City Housing Authority projects. Together they formed a joint venture that in December 2014 acquired a 50 percent stake in 874 units within six complexes. The initial payment was $150 million, and the developer will pay $100 million over two years and another $100 million in revenue over 15 years, the Wall Street Journal reported. As if to underscore that it’s hard to break into the business, one of the younger, active companies operating in affordable housing has a connection to L+M. Camber Property Group’s two principals both worked at L+M, and one, Andrew Moelis, is Ron Moelis’s son. Next was Monadnock Development, the firm founded and led by Nicholas Lembo, that has been building affordable housing for decades. The company had 4,053 units in 18 projects since 2013. 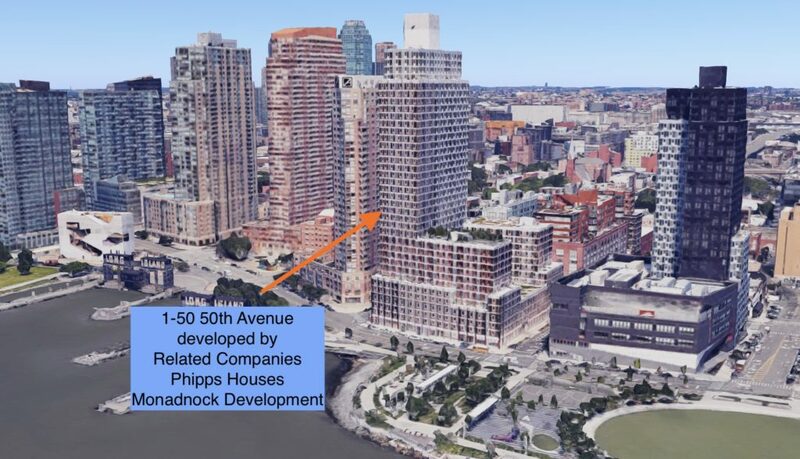 The firm’s largest project was the 619-unit tower at 1-50 50th Avenue in Hunter’s Point done in concert with Related Companies and Phipps Houses. Monadnock’s largest program (a package of individual projects) during this time period was Compass Residences in the Bronx’s Claremont neighborhood, where the firm obtained financing for six buildings with 1,113 units. Another large project was Mount Hope Preservation Apartments, a $100 million rehabilitation of 497 units spread across 13 buildings in the Mount Hope neighborhood in the Bronx. Monadnock partnered with Notias Development and the Mount Hope Housing Company in that project. In third place was BFC Partners, which had 3,285 units within 12 projects. The largest program was Essex Crossing, which is a joint venture with L+M Development, and has had 945 units financed. BFC’s largest individual project was North Shore Plaza, a 536-unit Mitchell-Lama development in Staten Island, formally known as Arlington Terrace. BFC bought the complex in 2014 for $75 million, Capital New York reported. Related Companies, which Stephen Ross founded as an affordable housing development company, slowed its pace in city-backed affordable housing development last year. It did not have a city-financed project during the first half of 2018. Related may have been distracted by other projects. This month, the company formally opened the $25 billion Hudson Yards complex, with soaring new office towers and, according to the New York Times, just 430 units of affordable housing units planned. Related is not out of the affordable business, however. In January it announced it would build 340 units of affordable housing on Roosevelt Island, in partnership with the Hudson Companies. Its largest project was the 619-unit Hunter’s Point property, done with Monadnock. Its second largest project by unit was a 602-unit in Queens hit by Hurricane Sandy that was given a $6.3 million loan in 2017. In fifth place was Phipps Houses, the city’s oldest affordable housing developer, formed in 1905. The firm had eight projects with 2,087 units. Its largest project was the 619-unit Hunter’s Point building, developed with Related and Monadnock. After that, their second-largest project was Rockaway Village’s first site with 457 units, at 20-02 Mott Avenue, which was given a $105.8 million city loan in June 2018. Why is NYCHA’s rent collection rate falling? Copyright © PincusCo Media LLC All rights reserved.